A top-notch hotel has top-notch towels. Soft bath towels in the pool area, quick-drying hand towels in public restrooms and lightweight washcloths in guests’ bathrooms can elevate the perception of your hotel. Get what you need for your guests at Towel Super Center, where we provide 100% cotton washcloths for our customers. Cut down on the time it takes to find the right white washcloths for any situation. Save money and keep your supply at the right levels by purchasing as many units of 12 wholesale washcloths you need. We make it convenient for you to look your best and make a great impression on your visitors. White washcloths can turn your public restrooms up a notch by offering an alternative to drying hands using paper towels. Simply incorporate white washcloths into your restroom offerings for the pleasure of guests who want a softer touch. Not sure you want to supply your public restrooms with washcloths made from durable cotton? Consider adding them to your private, employee-only restrooms to give workers a fabric option for hand drying. Your gym and fitness area is going to encounter a lot of moisture. It's just the nature of the space. And you can provide wholesale washcloths for two specific purposes. The first is to allow patrons to quickly remove perspiration from their hands, faces and necks. Many gym goers don't need a large towel to stay cool during and after a workout. Having wholesale washcloths in a basket or stacked neatly by the water cooler gives them another choice. Additionally, white washcloths can be used to wipe off equipment. Be sure to place them next to an antibacterial spray to encourage your guests to utilize the washcloths for hygienic reasons. Have you ever thought about how many people touch the front desk during the course of one hotel or motel day? People constantly come in and out, from guests to vendors to employees. This causes the front desk surfaces to become dirty quickly, which can lead to them losing their luster, as well as becoming places that attract a host of germs. Your front desk staff deserves to have wholesale washcloths at the ready, so they can quickly and conveniently wipe down the desk without missing a beat! Plus, when you have these washcloths on hand and easily accessible, you can quickly clean up messes — hand them to a sweaty guest who just finished unloading their bags or offer to parents whose baby spit up while checking in. You can't go wrong with having wholesale priced white washcloths to up the hospitality level and improve your efficiency, not to mention your customer service. Frustrated by white washcloths that get dingy immediately or never seem to hold up for very long? You'll appreciate buying your washcloths from Towel Super Center. 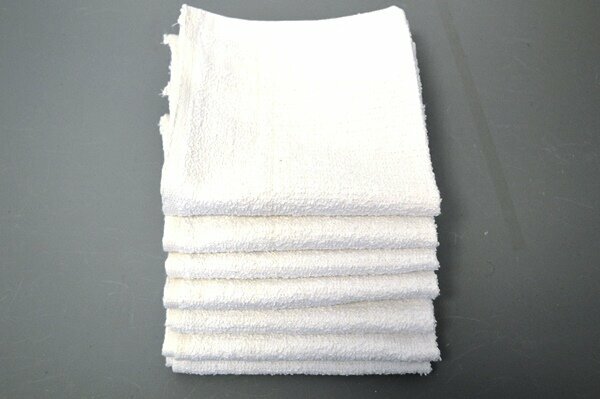 Our high-quality, terry cloth washcloths will stand up to repeated washings. They dry quickly, meaning less time out of commission at the laundry and more time out on the hotel floor, wherever you need them. You can help extend their life by making sure you pre-treat stains with your favorite product and use a bleach alternative that's gentler on cotton fibers. Finally — it's a washcloth that works as hard as you do to keep your business up and running! We encourage you to buy in bulk for our cotton washcloths. The more you buy, the lower the price on our products will be, so it pays to stock up and get that discount. Plus, you can finally get rid of your mismatched washcloths for good — an extra bonus of buying everything you need at once. Fresh washcloths can help show your business has committed to high quality. Contact Towel Super Center today to learn more about our pricing options.